Reply With Templates will simplify the process of replying to repetitive email messages using pre-made email templates. Reply to email messages using pre-made templates. If you are sick of typing out the same reply every time someone emails you with a common question, Reply With Template add-in for Microsoft Outlook will be your solution. Now you can compose your reply template once and reply to emails in just two clicks. You can open the same message template and send it over and over again. Reply With Templates is integrated into Microsoft Outlook email toolbar for easy access. It will help you to reply to repetitive email messages and save your valuable time. Use "ReplyWith" to reply to an email ("Reply") with a predefined email template with a single click. Use "ReplyWith to All" to reply to all e-mails ("Reply to All") with a predefined email template. 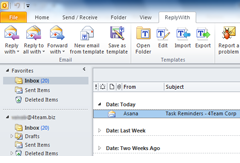 Create and modify Templates as easily as email using New Templates or the Outlook "Post in This Folder" feature. Create Templates from existing emails. Personalize Replies. Personalized fields, such as "Full Name" or "Company", can be added to the templates. Hot keys can be assigned to templates for quick use. Support of Windows 7 and Outlook 2010. Favorite templates can now be marked with a special color flag. Import / export of Microsoft Word templates, export of Reply With templates into Word templates. Save Time with ReplyWith Email Templates samples. Share your templates with friends and coworkers.